When Art Soto was a sophomore in college, he and his friends protested the use of napalm in the Vietnam War. The jelly-like chemical proved effective in guerilla-type warfare by sticking to soldiers’ skin and searing it to the bone at 1,500 degrees. Unfortunately, it did the same to innocent civilians. Just one year later Soto found himself ordering a napalm firebomb against a platoon of enemy soldiers in the Vietnam jungle. Soto served 12 months in Vietnam, and when he returned on Oct. 1, 1970, he understood why veterans struggle to talk about their war experience. For veterans, adjusting to life after a war can be as daunting as surviving one. Approximately 38 percent of Vietnam veteran marriages failed within six months of the veteran’s return from Southeast Asia and the divorce rate among Vietnam veterans is significantly higher than for the general population, according to the U.S. Department of Veterans Affairs website. Some vets return to the states with post-traumatic stress disorder (PTSD) and relationships can suffer because of family members’ inability to empathize with their trauma. Dry Hootch, a coffee house and meeting space on 1030 E. Brady St., provides a place for vets to socialize with others who understand their experiences. It also has a location in Madison, and is open to the public. “Dry” means an alcohol and substance-free environment, and “hootch” refers to the aluminum-roof barracks Vietnam veterans lived in during the war. 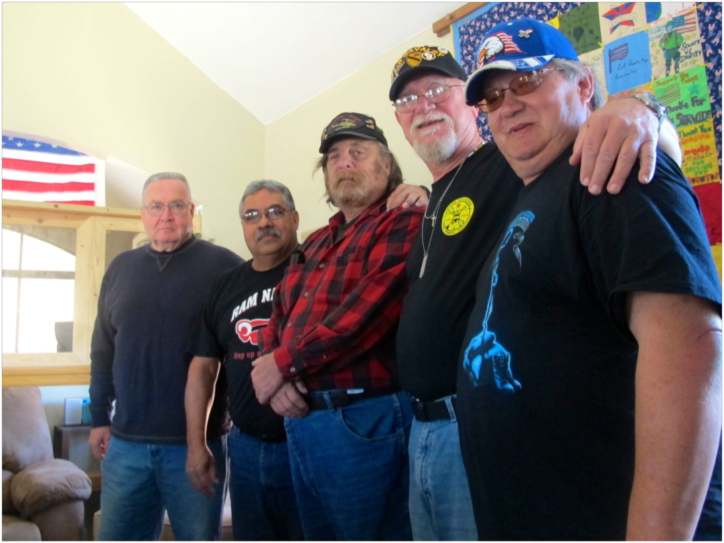 Two years ago, Future Milwaukee helped Dry Hootch implement a peer support network for veterans over age 60. Future Milwaukee is a graduate leadership program affiliated with Marquette University that works to create positive change through civic engagement. The benefit of the program is that attendees are more likely to speak with each other than with a clinical psychologist, Soto said. “It’s because they know what you’ve been through,” he added. Soto, 64, joined the support group after diagnosing himself with PTSD 30 years after being discharged. “I went to a support group for Afghan and Iraq war veterans and realized I had the same symptoms,” he said of PTSD. Soto feared that veterans would only share war stories at the meetings, but he soon discovered a much different group culture and environment. “We’re not so much a group for counseling as we are for conversation and sharing what’s on our mind,” said group mentor Jerry Zeckmeister, 63. Dry Hootch’s peer support network meets Friday mornings on the second floor of the coffee house. It attracts between five and 15 veterans, most of whom served in Vietnam. At a recent meeting, a Marquette University student also attended to complete a psychology service-learning requirement. To a first-time visitor, the support group appears similar to an Alcoholics Anonymous meeting. However, there is no prayer, acknowledgment of a higher power or reading from universal “rules.” While a Dry Hootch “book of knowledge” exits, it remained unopened in the room’s corner. Instead, men gather over coffee and Sendik’s Food Market doughnuts, and claim their preferred seat. Nearly every attendee displays his armed-forces affiliation on his hat or jacket and makes jokes that show a rivalry between the Army and Marines. Aside from general announcements, one of which addresses a commemorative brick sale to raise funds for Dry Hootch, the meeting lacks formal structure, but encourages full participation. Thirty minutes into the conversation, some attendees reveal latent guilt because they never faced combat. Others struggle with the appreciation recent veterans receive. “When we returned we got nothing,” said Dave Saula, 65. Saula said he worked quickly to re-assimilate into society. It’s what was expected of him, he said. Now, when strangers thank him for serving the country, he doesn’t even know what to say. According to Soto, the Dry Hootch location on Milwaukee’s East Side used to attract a myriad of protests, due in part to its close proximity to student life on the University of Wisconsin-Milwaukee campus. Great Article! Awesome lead and video! It was great to learn how the Veterans created their own support network at Dry Hooch. It’s truly a great and useful piece of info. I’m happy that you simply shared this helpful info with us. Please keep us up to date like this. Thanks for sharing. A truly mind-boggling testimony of a True Warrior!